April really is the cruelest month. This month has been the grayest, dreariest, cloudiest and rainiest on record. Early in the month, we had a random 80 degree day, which offered up such hope for spring, but then we fell back into an ugly pattern of rain, clouds, and melancholy, with the occasional rumble of thunder. We even had a couple days of snow – including some that stuck as late as the 18th, which made my opening daffodils shrink back for a few days. Yesterday and this morning, things were looking up, with sunshine and 60s. My 7 mile run mid-day was sunsoaked and created fresh tanlines along my arms, for the Garmin and RoadID. I even have tanlines in my elbows, which I suppose indicates my running form is good. After my run, I dragged my patio table and chairs out of the garage, and set out to mow the lawn for the first time this year. All the rain has made it jungle-thick and vibrantly verdant, and the mower struggled through some of the especially thick spots. When I got done I saw on the steps with some water and closed my eyes, inhaling the intoxicating aroma of fresh-cut grass. It smelled like summer, like sunscreen and caramel-spiked iced coffee and sweat. The sun felt so nice on my face, and I was tempted to pull out the lawn chair and a book and go relax in the backyard. But after a very windy day, with gusts over 45 mph, clouds are rolling in for another evening of storms. And April will go out as it began, dreary, gloomy and damp. Despite the rain, I had my biggest running month ever, clocking 60 miles. (My previous record was 55 last September.) And the tulips and daffodils seem to be thriving. So while April has been cruel, all is not lost. Here’s to an even better May. We have winterization in our lexicon, but not the springtime equivalent. Regardless, that’s how I spent part of my Saturday. I had four more windows replaced a couple weeks ago (both bathrooms, guest room and upstairs hallway – the latter used to funnel cold air directly into my bedroom), so I had no storm windows to put away this year. Now, I’ve replaced all the windows in the living areas of the house. All that remain are the back hallway, basement and front porch, none of which are a huge priority. I also cleaned out a winter’s worth of detritus from my flower beds and backyard. I filled an entire yard bag with dead leaves and other junk, and was thrilled to find stuff already sprouting underneath. 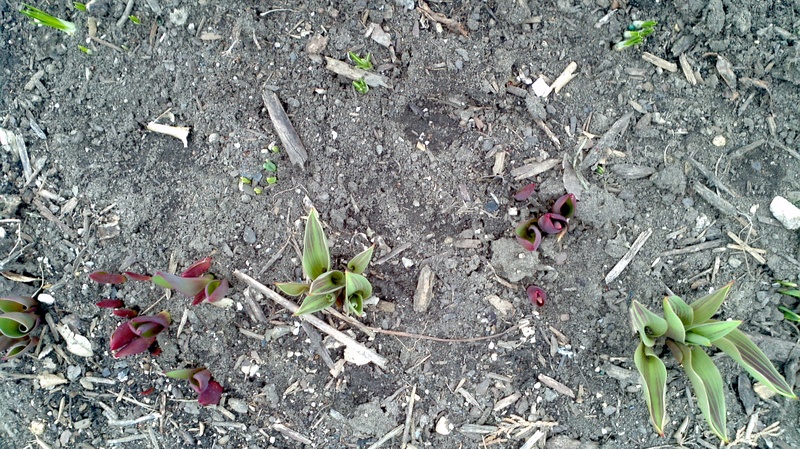 In the front beds, I had seen tulips beginning to grow, but after removing the leaves, I found daffodil sprouts, too. Along the back fence, I found the early shoots that will become June’s tiger lilies. Inside, I drained and cleaned the humidifiers, and now they’re air drying until I store them for the summer. I dusted and organized. The missing piece was finally found in the backyard once the snow melted. 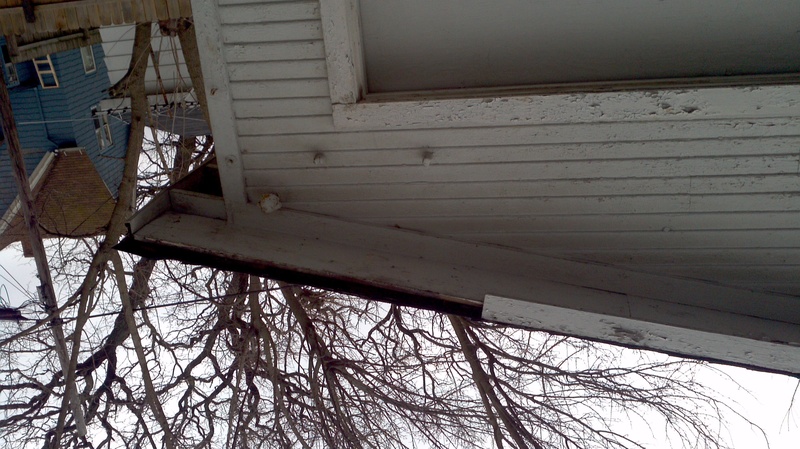 Fix the soffit that the blizzard tore off the side of the garage. Though it’s not very high, it requires a ladder, and thus I won’t tackle this quick fix unless I have someone spot me. Especially at the back of the house, I’m wary of doing anything where I could fall and no one would notice. Fix the frost heave/front gate situation. A couple years ago, a frost heave appeared in the middle of my driveway. As soon as the weather warmed, it collapsed back into itself, enabling me to seal it and move on. A couple weeks ago, when I first tried to close the gates, I couldn’t get the gate over the heave. Now, it’s collapsed, so I can close the gates, but they’re misaligned so they don’t meet in the middle and latch. 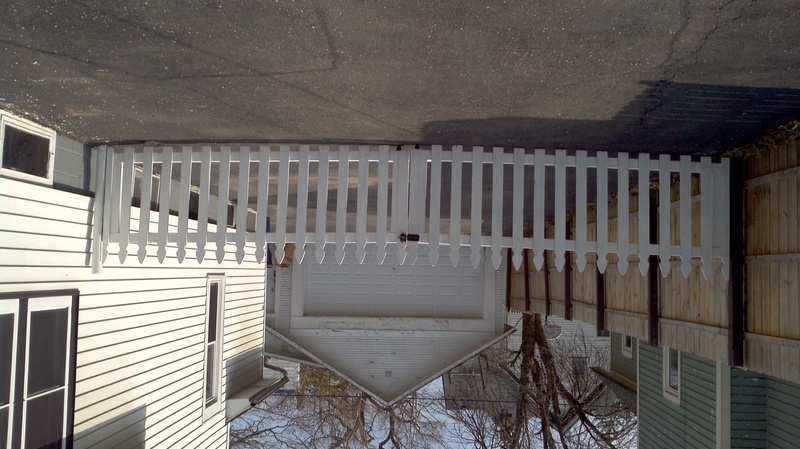 I’m weighing my options: raise up the gates (oh-so-heavy and cumbersome; would require a second and potentially third set of hands) and install new hinges, sand off the bottom of the gate that currently rests on the ground, or just leave hope that the warm weather adjusts the driveway a bit more. Put away the boots and clean, clean, clean. I’m afraid that putting away my winter boots right now might tempt fate, so I’ll hold off at least another week on this one. I also need to pull out the hose, turn on the water and get ready to plant. And I can’t wait to drag the patio furniture out for the year. What do you have to do for spring? As you might have heard, we got a bit of snow last week. Snowpocalypse, or #snOMG as Twitter was calling it, was unlike anything I’ve ever seen or experienced. I vaguely remember the 1999 storm, but I was a senior in high school still on Christmas break. This storm was incredible for its fury. All week, Skilling and others kept raising the expected accumulation totals and narrowing down the exact hour the storm hit. And they were right. I woke up Tuesday morning to a fresh inch or so of snow and word that Metra was rearranging their afternoon schedules to help people get home ahead of the storm. All day, the skies were relatively clear. Until 2 PM, when suddenly, I looked out the 22nd floor windows and saw snow blowing horizontally, swirling violently. The few coworkers who had come into the office started leaving to catch the special early Metra trains. I heard that Union Station was chaotic, so I decided to wait an hour to let things thin out a bit. I left work at 4:15 and hunched against the wind and snow until I got to the eerily empty Union Station. I boarded the 4:50 train, which closed the doors right on time, with several empty seats. We sat for 10 minutes and then departed. Just past Western Avenue, we stopped. And sat. For nearly two hours. The conductors had no information, but I was able to learn from Twitter that there was a switch failure ahead. We sat on a bridge, near Damen and Grand, as the wind rocked the train back and forth. I was hungry and cursed myself for leaving an apple on my desk. Another passenger joked about ordering a pizza, if we could convince someone to come to the rail bridge. Eventually, we pulled into Elgin just before 8 PM, and I made a very difficult walk home, as the 40 mph winds flung snow at and around me, obscuring my vision and sucking my breath. Scenes from Laura Ingalls Wilder’s Long Winter filled my head, as I thought of pioneers getting lost in blizzards, stringing clothesline to navigate from house to stable. I wish I had a rope to follow home. As I killed time on the train, I had seen several Twitter friends mention power outages. When I finally got close to my house and saw the porchlights, I breathed a sigh of relief. But as I trudged through the drifts on the driveway, I found a couple shingles. I think they’re from my roof, but I’m still not quite sure. 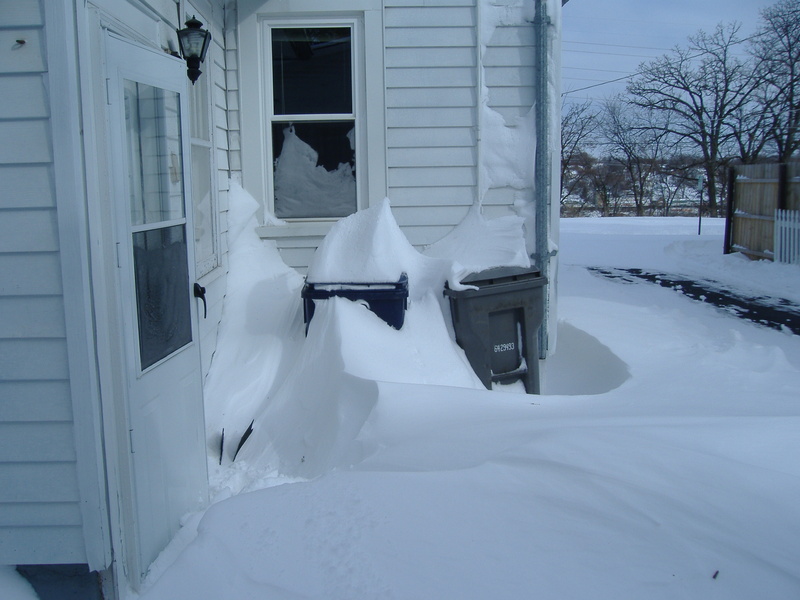 I had made it home, but had to dig out my back door, which was already encased in snow nearly up to the doorknob. As I left work, I had hoped to settle in early and study, but after a four hour commute, I curled up with a glass of wine and listened to the storm. I’ve been in this house nearly five years, and I’ve never heard it rock and shake and creak quite like it did Tuesday night. I followed the storm on Twitter, as Elgin’s city manager tweeted from a snowplow, and crossed my fingers every time the power flickered. Finally I went to bed, but laid awake, listening to the howling storm. When I woke up, the winds had died down quite a bit, but the house seemed very odd. I realized it was because nearly every window was covered with frozen-on snow, obscuring much of the light. I surveyed the damage: officially, we got 20 inches, and I had drifts nearly 4 and 5 feet tall, some next to bare patches of pavement. A piece of my garage roof soffit was lying in the backyard. But since I was working from home, there wasn’t really a snow day. 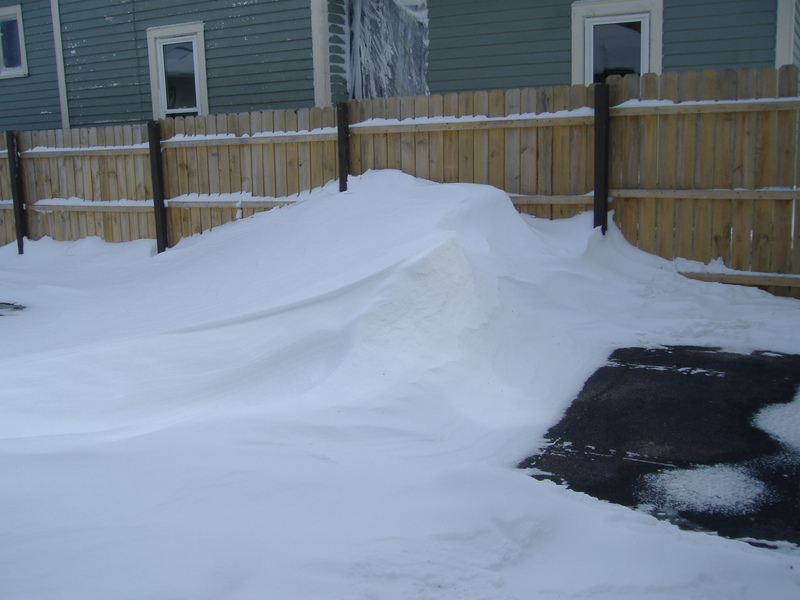 I went out at lunchtime and began shoveling – after I tunneled to the garage to retrieve my shovel. I went out for a couple brief spells in the afternoon, thankful I didn’t really need the car until Saturday. Luckily, I had no pressing need to take out the trash. Later, I met up with some neighbors and helped clear the sidewalks of the main street in the neighborhood. Afterwards, we went to the local bar for chili and beer. So while I didn’t get a traditional snow day, it was still a pretty good day. I even settled in with a mug of tea and pulled out The Long Winter before bed. But that said, I think I’d be okay if we didn’t get any more snow this winter. Though it was kind of pretty. I do love the view over the river. It’s five o’clock, and there’s still a hint of daylight to the west. We’ve turned the corner on winter, I hope. Meterologically, we’re not quite there yet, and yesterday the windchill dropped to 21 below zero as frost froze on my windows and the cat burrowed under the down comforter. My garage door froze shut, too. This is always the toughest part of the year, when I start to believe the hype about Seasonal Affective Disorder (aptly acronymed SAD). The days are short and dark, and we see stats tossed around about getting only 6% of the possible sunshine over a week’s period. All the Christmas cheer has been boxed up (well, except my tree, since I couldn’t get it back into the box, but it’s in the basement awaiting purchase of a giant Rubbermaid tote). The next holiday off work isn’t until Memorial Day. This past Monday was what some term “Blue Monday,” for the most depressing day of the year, as the pre-Christmas credit card bills come due, resolutions are being abandoned, and people are beginning to tire of the darkness. The cold and dark drain you, indeed, and I’ve considered buying a wake-up light (which is inexplicably sold by the ounce on Amazon) to combat the hardest part of the season: waking up – and leaving the house – before dawn. I’m sleepy and crabby, as is everyone else. I just want to hibernate and curl up on the couch under a blanket, drinking mug after mug of tea. And sleep. I really want to sleep. But there’s hope in the form of a few weak rays of sunshine. Heck, not even sunshine, though that has magic restorative powers that we could all really use right now. Daylight would suffice. Daylight during non-work hours is huge. I’m lucky this year in that I’m working from home more, which means I get to see my house by daylight. In previous years, entire weeks have gone by where I’ve done all my coming and going before dawn and after sunset, marveling on Saturday mornings at the accumulated dust. Hang in there, fellow Elginites and Chicagoans. February is usually the hardest, grayest month, but it’s also the shortest. We’ll make it, I promise. Happy New Year! After blogging every single day in December (32 posts in 31 days, in fact! ), the new year hasn’t started off quite as strong. That holds true for more than writing. I also haven’t run a single step since New Year’s Eve, when it was a gorgeous 50 degrees. So that was the first week of the year. By Friday I felt better but was making up for lost time on school and work. Then it got COLD. When I started running last year, I waited until mid-March, thinking it would be easier to build a habit when it wasn’t miserable outside. And I was mostly right about that. But when October hit, I realized that to continue the habit, I would have to actually run in the cold and snow. I did what I always do before embarking on anything new: I researched. My chief running instigator gave me lots of advice on dressing for the cold, and talked about how nice it is to run through fresh snow when everything else is quiet. I nodded enthusiastically, signed up for a winter race (the F*ing Freezing Frozen Lake Half, my first) and asked for cold weather gear for Christmas. I really have enjoyed some of my runs out in the 25-40 degree range. Though I have to battle across the many (many!) 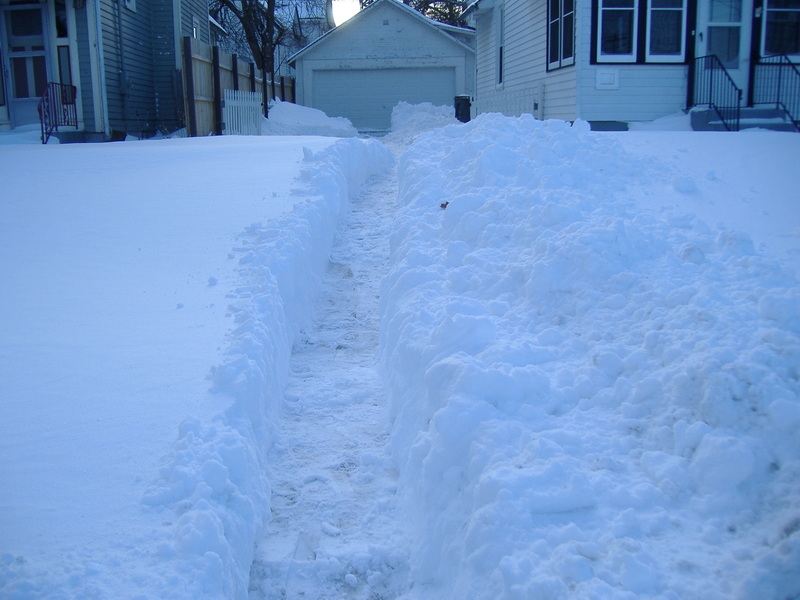 uncleared sidewalks in my neighborhood, YakTrax do help, and it’s nice getting fresh air when most people are cooped up indoors. But really, it’s been so damn cold this winter. I’ve lived nearly my entire life in the Chicago area, so I’m relatively used to the winters. (Really, I don’t know any better – I was too young to remember the five winters I spent in Indianapolis, and there was only one winter in Budapest.) But December was one of the coldest on record. And between the bitter cold, the ice and the 4 PM darkness, it has not been easy getting out to run. Heck, even Mr. Cold Weather Running himself has had enough. Sunday morning, it was 8 degrees when I woke up. 8. Single digit. I couldn’t bear to look at the windchill. I threw a hoodie over my fleece pjs and shuffled downstairs for coffee. I went outside (danger! danger!) to retrieve the newspapers and thought about running. Screw this, I thought. It’s supposed to warm up into the 20s! I’ll run later! Of course, as the day progressed, I ended up spending more time with my parents than planned (time well spent, though) and didn’t get home until after dark. So yes, it was 28 degrees, but too dark to safely run and see obstacles (like uneven or uncleared sidewalks) or be seen by cars. And while I’ve considered the headlamp route, I’m not quite there. I have a 10k trail race this weekend, and the forecast is in the 20s, so I’m optimistic. I ran the 5k trail race of the series last month, and it was freezing, in the single digits even at noon. I discovered that trail racing is tough when there’s snow on the ground, and it sounds like this weekend will reinforce that discovery. But at least peer pressure will motivate me to get out there. Throughout the year, I’ve been taking – and making – more time to enjoy the wonder of the world around me. I’ve come to enjoy the marvels of a quiet house, with no sounds beyond the ticking of the clock and the snoring cat. I spend more time than ever outside, ostensibly to run, but really, it’s to be outside. Running or walking or just being in a place where you’re alone and small, surrounded by beauty and grace, is wonderful. And it helps bring perspective to the chaos and busy rush of daily life. After a crazy week of deadlines and work and trying to squeeze it all in, twenty minutes in the backyard, lying in the grass and gazing up at the stars, listening to the chirp of crickets, makes it all better. While part of me shrieks that those twenty minutes could be better spent cleaning the bathroom or finishing a project, I’m getting better at silencing that voice. Because taking time to appreciate the wonder around us makes everything else worth it. 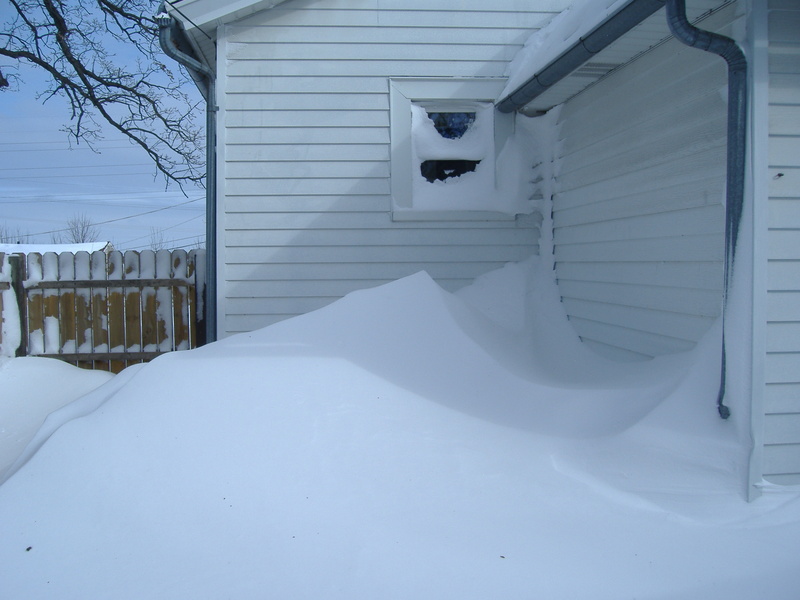 Now, if you’ll excuse me, I have a driveway to shovel. I rather enjoy the quiet of the world when it’s snowing, when sounds are muffled and no one else it out. 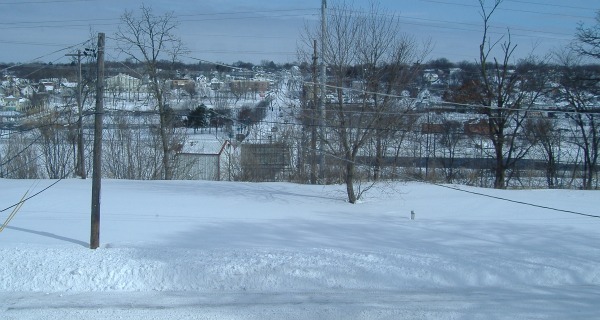 I don’t bother with music – I just marvel at the Currier & Ives scenery and am thankful that I can manage it by myself. This post is part of #Reverb10, a month-long project to reflect on the year nearly gone. Read all my #Reverb10 posts, or learn more. Why is it so damn cold on Metra trains? I’m not talking about that momentary blast of cool when you step from the hot sidewalks into the house, or the comfortable 77 degrees I set my thermostat at when I close up the house and turn on the AC. I’m talking about see-your-breath, numb nose and toes, where’s-the-coffee cold. The cold that prompts everyday riders to carry a jacket, a hoodie or a scarf to brace against the inevitable cold. After spending all day working in my meat locker cubicle, the four block walk to the train is just far enough to thaw out my arms and legs. That initial step outside from the icebox to the heat is divine, as the warmth washes over my body. I start to enjoy the summer weather, to remember why I like being outside. Then, I board the train, and the cold is a slap in the face as I walk through car after car, trying to find the least cold spot to sit, passing other commuters wrapped in pashminas or wearing fleece sweatshirts more suited for November. Over time, I’ve identified trends in my usual trains: which cars are even colder, which ones may merit gloves and a hat. A friend and I often referred to these cars as “penguin cars” and joked about seeing polar bears and eskimos rather than Chicagoans. Occasionally, a car’s AC will go out entirely, rendering it insufferably hot. You can always tell these cars as you come through the train by the absence of passengers. For awhile, one car on my usual evening train had a faltering AC system that only worked about halfway. This was my favorite car, as I could leave my pashmina in my bag and ride home in relative comfort. A couple weeks ago, this car was suddenly as cold as all the others. In the vestibule, a sticker proudly read, “This car’s HVAC system was repaired with funds from the American Recovery and Reinvestment Act.” Once again, the good intentions of government have gone awry. Perhaps I should stock up on pashminas. It’s happening: we’re rapidly losing our long hours of languid summer sunshine. The last few mornings, when the alarm goes off at 6, it’s still sunrise rather than nearly-full daylight. This morning, the sun loomed as a big red ball to the east. I hate the darkness of the winter. I hate leaving the house in the dark and returning home in the dark, when entire workweeks can go by without ever feeling the sun on my face. But in some ways, I’m more focused in winter. When it’s light out, I want to be outside, running or biking or just lounging in the yard with a book. As long as it’s light outside, the day seems full of possibility and promise. There’s no rush to get things done. In winter, I don’t feel as if I’m missing out on the gorgeous, fleeting weather. Another gray, slushy day? I’d rather be inside working, thank you. But now, as the sunlight softens and falls farther to the horizon earlier in the evening, fall is coming. The free evening concerts at Wing Park are over, the last one rained out. Kids are already back to school, and I just learned I’ll be joining them in a few weeks. We’ve had a few cooler nights when I’ve had to wake in the middle of the night to close the bedroom windows. This summer’s nearly over, but there’s still time for a stroll through the fields or a trip to the farmer’s market. It’s already been a great summer, but let’s go out on a high note. What’s left on your must-do list for summer? I still have to break 30 minutes in a 5k, and I want to spend more time in the backyard, with wine, after dinner. I may need to invest in some anti-mosquito tiki torches to make that one happen.